Wildfires across the United States have taken more than 100 lives and cost more than $25 billion dollars in property losses in just the last two years. That’s why it’s so important to take steps to improve the wildfire safety of your home and community. Become a wildfire safety hero! Begin your journey towards wildfire preparedness by getting involved or organizing a wildfire safety project on May 4. 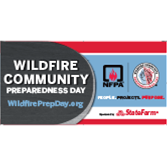 Tell us your story at #WildfirePrepDay or on Facebook. You can help promote wildfire safety by encouraging residents to work together on a project or event. Participation helps create a sense of community, where neighbors begin to look out for each other. Wildfire Community Preparedness Day projects can also help strengthen relationships between residents and the local fire department, land management agencies, community leaders, and elected officials. See a list of possible projects. Download our toolkit, which includes checklists, key steps, safety tips, and much more. Distribute our fact sheet (PDF) to let people know more about the event. NEW! Get guidelines for capturing images that tell your story (PDF). NEW! Use this news release template (docx) to announce your community's participation. One of the criteria for becoming a Firewise USA® recognized site requires participating in an annual wildfire risk reduction project. Wildfire Community Preparedness Day is a great time to start. Contact your state liaison to begin a community wildfire risk assessment (PDF) to identify and guide your priorities and activities for Prep Day and throughout the year. Demonstrate your commitment to wildfire preparedness by adding your project to the nationwide event map. Promote your Wildfire Community Preparedness Day with this colorful Banner! 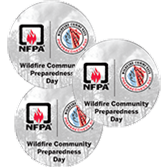 Volunteers can wear Wildfire Community Preparedness Day Stickers to show their community spirit. Funding awards were made possible with generous donations from State Farm. Award funding is used for wildfire safety projects. See the list of winners. Motivate neighbors and community members to work together to make where they live a safer place from wildfire. Project map Put your Wildfire Community Preparedness Day project on the map. Project ideas We’ve developed more than two dozen project ideas for individuals, families and groups. Success stories Read about some successful projects from Wildfire Community Preparedness Day.